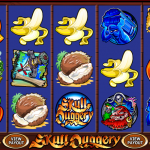 Skull Duggery is a Microgaming video slot game with a pirate theme. This is one of the most popular themes when it comes to online slots, so it’s no wonder that every software provider has a pirate slot of their own. Since this is an older game the visual effects are on a low level. The reels seem to spin too fast and the symbols just appear on the screen which is common in older slot games. Still the symbols in the slot are well designed and are in perfect correlation with the game theme. 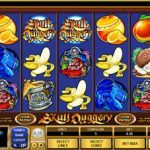 The slot also has a rich pay table and an attractive bonus feature which is reason enough to give Skull Duggery a try for real play. The wild symbol in the game is the Skull Duggery Logo. He comes with a maximum payout of 12.000 coins when 5 of them land on a winning pay line. He substitutes for the low paying food symbols only, but will triple any payout he contributes in. The slot also has a Scatter symbol, but he doesn’t trigger any bonus feature. He only offers a cash payout of up to 200 x stake if 5 of them land anywhere on the reels. The only classic bonus feature in the game is triggered by the Bonus symbol. Once 3, 4 or 5 of them land on an active pay line the Booty Time Bonus is triggered. In this feature the player needs to choose one of the five Pirate symbols. Depending on the number of triggering symbols players can win up to 3.000 coins in the Booty Time Bonus game. 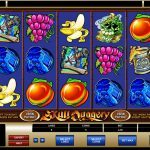 Skull Duggery is an old but still interesting pirate slot coming from Microgaming software. This is a low to medium variance slot which is perfect for playing on higher bets and for wagering big bonus requirements. If you’re a fan of retro magazines then you should consider playing Shoot! a 5 reel slot by MicroGaming.